Arsenal followed up their Premier League victory over Chelsea more than a week ago with another against Cardiff City on Tuesday night. 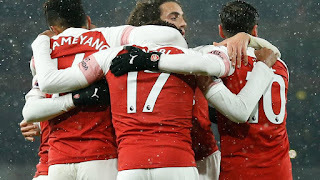 Goals from Pierre-Emerick Aubameyang and his jolly friend Alexandre Lacazette gifted the Gunners a 2-1 victory. Before kick-off, the Emirates Stadium audience took out time to pay tribute to the missing duo of Emiliano Sala and pilot David Ibbotson. The former alongside the latter went missing while heading to England from France after Sala had signed a record deal with Cardiff. Searches to find the missing plane and individuals have yielded no positive results so far. Mesut Ozil, the captain for the night, made the starting lineup as well as Mohamed Elneny, Nacho Monreal and Matteo Guendouzi as Granit Xhaka, Alex Iwobi and Aaron Ramsey were on the bench. There were a total of seven changes from the side that got knocked out of the FA Cup by Manchester United. Ozil helped us mount pressure in the opening periods of the game though it was Guendouzi’s class that almost gave Lacazette the chance to score. Bobby Reid then went close twice for the visitors, hitting a shot wide and a header over to the advantage of Arsenal who desperately needed a win. Two penalty calls (one for each side) were not honoured by the referee in the first half. Iwobi was brought on to replace Elneny in the second half and it was his foresight that helped pick out Kolasinac’s run before the Bosnian went down under the challenge of Bruno Ecuele. A penalty was given. It was converted by Aubameyang to make it his 18th for the season. Lacazette got the second to make it 2-0 and despite conceding one late in the game, the Gunners were still able to leave with all three points. We remain in 5th place level on points with Chelsea who have a game more to play. Elsewhere, Manchester United came from behind to play a 2-2 draw with Burnley while our next Premier League opponents who will host us at the Etihad Stadium this Sunday lost 2-1 to Newcastle United.